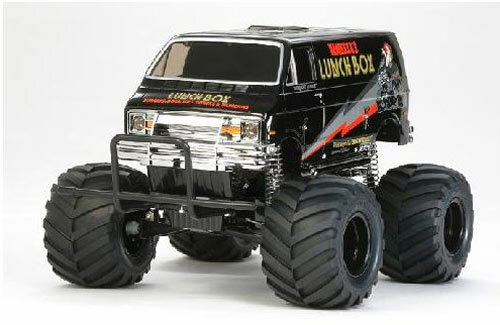 All Products > "57849 Tamiya 1/12 XB Lunchbox Black"
The ever popular 1/12 scale R/C Lunch Box van is available as a special "Black Edition" model, featuring a stylish combination of a Black ABS molded body and chrome-plated wheels. This Ready to Run version is pre-assembled by Tamiya's expert assemblers and comes equipped with a 2.4Ghz radio for interference free driving in your neighborhood park. The R/C Lunch Box (first released in 1987) was loved for its camp appearance as much as for its R/C performance. The boxy minivan body is raised up over the monster truck wheels to ensure that this R/C van will get attention anywhere you choose to drive it.